Beethoven’s first symphony is an important landmark in his compositional output. It was his first major work for orchestra. His only significant orchestral writings previously were his first two piano concertos, and a few short pieces. Yet his use of the orchestra is both assured and highly original and foreshadows the achievements that are so obvious in his later symphonies. It is wrong to the think of the first symphony as an early work. Beethoven was thirty when he finally completed it. At that age, Mozart had completed his 36th symphony (the Linz) and Schubert had written all nine of his symphonies. Furthermore, the composition occupied Beethoven for a very long time. The earliest known sketches date from 1795, suggesting that his first symphony took the longer to write than any of his later ones. Perhaps the young composer was struggling with the seeming impossibility of writing a symphony that could compare favourably with the whole series of symphonic masterpieces that had flowed effortlessly from the pen of Joseph Haydn in the early 1790s. At its first performance the first symphony had a rough reception from the contemporary critics, one of whom described it as “a caricature of Haydn pushed to absurdity”. 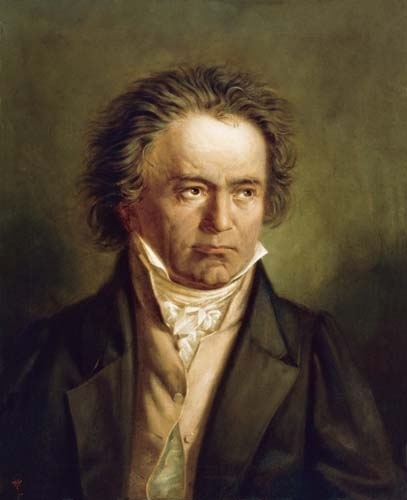 However it rapidly gained popularity with the public and established Beethoven’s reputation as a major orchestral composer in Vienna. Many authors have written in detail about the slow introduction to the symphony, whose opening bars were a particular target for the contemporary critics. A conventional symphony of the time would have announced the key tonality clearly at the start of the work, but instead of starting out with a C major chord Beethoven teases the listener by suggesting first that the key is F major, and then G major. To modern listeners the opening sounds perfectly innocent, and indeed much more audacious harmonic progressions had been used regularly by Haydn and other contemporary composers, but virtually never at the opening of a symphony. Beethoven clearly liked the device as he used it again almost immediately in his Prometheus overture, and at one point planned to open his third symphony with it. After the teasing of the slow introduction there are few surprises in the rest of the first movement. It follows the sonata form model of Mozart and Haydn, but with a liveliness and exhilaration that is completely characteristic of Beethoven. The graceful theme that begins the andante is presented as a series of entries in fugal style, though the movement does not develop as a fugue and does not contain much contrapuntal material. Rather it is a graceful and beautiful movement in simple ternary form (ABA) with the repeat of the first section being more varied and decorated. It is in the third movement that the originality of Beethoven shines at its brightest. He named the movement Minuet and Trio, rather than Scherzo, but probably only with the intention of making the work more acceptable to publishers. The pace is considerably faster than the sprightly minuet movements of Haydn, and indeed it would be a remarkably athletic feat to dance to it. The harmonic language is highly audacious and the orchestration, particularly the use of the tympani roll, propels the movement forward with a vibrant energy and dynamism not found in earlier minuets. The trio, a dialogue between the winds and strings, is also unconventional in using the full orchestra rather than a smaller grouping of instruments. In contrast to the groundbreaking third movement, the final movement is very like a tribute to Haydn. It is unlikely that Beethoven would have consciously intended to eulogise his former teacher, with whom he had a tempestuous relationship, but none the less he seems to have assimilated all the most brilliant aspects of Haydn’s orchestral technique and incorporated them into a movement in his own inimitable style. The short slow introduction, in which the violins repeatedly play a rising scale, varying the rhythm and adding an extra note each time, is a good example of Beethoven’s wit. When the allegro finally starts it is full of energy and exuberance with dramatic interludes and brilliant orchestral writing. Beethoven's first symphony was performed by the Portobello orchestra on the 15th December 2007. The conductor was Anthony Weeden.